Learn about A1 Overseas International’s auto shipping to Singapore and get a FREE quote when you call 1-800-450-5319 or fill out the form! Trying to have a vehicle shipped to Singapore is difficult. The auto import and export policy that the country has in place makes it extremely difficult to comply. Nevertheless, A1 Overseas International, an international auto transport organization, will do everything they can to help, even assisting you with the policy’s requirements. Call the Embassy of the Republic of Singapore for more information on their auto import policy. The policy for import may change frequently. So, give them a call at least two months beforehand to start preparing with plenty of time. 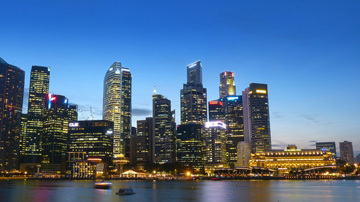 Make sure it is easy for you to get your vehicle shipped to Singapore. All countries have their requirements, but they must be fulfilled. Only automobiles that are three years old or less are preferred into the country. There will be no additional fee for the import. If the vehicle is older than three, the vehicle will be subjected to an additional charge of $10,000. Any modifications must be approved by vehicle’s manufacturer. The vehicle must be imported directly from the manufacturer or registered as a new vehicle from a country with higher emission standards than Singapore. The vehicle must pass an emissions test through the VETL. The vehicle must meet safety standards held by The Land Transport Authority. Only right hand vehicles are permitted into the country. Provide proof of title, registration, insurance, passport, license, and other required documents. The vehicle must have CFC-free air conditioning and asbestos-free brake and clutch lining. Safety glass must be up to par with international standards. Call 1-800-450-5329 or submit the form for a FREE quote and further details on auto transport such as boat, motorcycle and car shipping!